I apologize for the quality/exposure of the videos today. We recently purchased a new camera and the instructions came in French.... So, I'm still learning how to use it properly! Hopefully I will have a good handle on how to adjust the settings for better videos soon! Just about a year ago, we started to make our ever-evolving music area in the backyard. After seeing some great instruments crafted out of wood scraps and pvc pipe at various children's museums, I put an outdoor music area on my wish list. 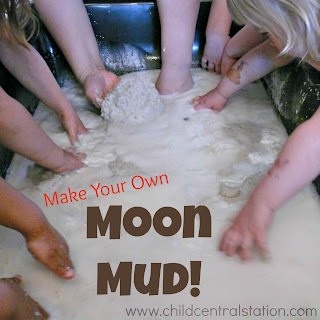 Then when Teach Preschool featured a post from Jenny from over at Let the Children Play on outdoor music, the inspiration and desire could no longer be contained! It was time to take that off the wish list and make it a reality. I like to think of all of our areas as semi-permanent with continual evolution! We are a small home based child-care, so our budget for equipment is not very large, but we don't let finances get in the way of providing a quality program. We are very good recyclers! Our first piece for the music area was our giant xylophone made out of 2x4s. Most of this was from scrap wood, but I think we did end up buying a board or two to finish it off. The photo above is how it initially looked. We found that the weight of the instrument was too great for the rope, so we opted to reinforce it with 2x2s instead and eventually we moved it to be anchored on the fence. (This was primarily for space). Our xylophone is now full of color! Anytime we do an art project and have left over acrylic paint, we bring it outside to our music area and jazz it up a bit! The xylophone is now a myriad of vibrant colors! Our bamboo xylophone didn't make it. After a short period of time, it began to rot. We anticipate trying a pvc pipe version this summer. However, the one we made from old coat racks is one of the children's favorites! (You could also buy copper or metal pipes from the home improvement store, we are just "garbage" collectors and were able to reuse broken coat racks) It makes a wonderful sound (as you can hear in the video!). I found a great tutorial online that tells you how long to cut copper pipe in order to create the music scale, so of course, we had to add that to our fence as well! Our banging post is still in good condition. (We left our music area out over the winter.) The wood that holds it all together is looking a little dreary, but nothing a couple of enthusiastic children can't fix with a few squirts of paint! One of our instruments is under constant consideration and change, our giant tractor tire drum. We are still trying to find a good drum head for it. Currently, we have a piece of painted plywood. Our thought is that plexiglass might make a better sound. (Now, we just need to find a piece of plexiglass that is large enough!) We want to make sure that whatever we put on there is sturdy, as the children like to walk along the edge of the tire and we want to make sure that if they were to fall, the drum head would be able to support them. We made some great tambourines out of metal can lids. (We have a great safety can opener that allows the cans to be opened with smooth edges). They now have a nice coat of red paint on them- as you can see in the video. We have a couple of chimes and a long version of the tambourines on the fence. We hope to add a few more things this year. Some of our thoughts are a "thunder drum" made from an upside down metal garbage can (inspired by Teacher Tom) and a pvc pipe xylophone. Do you have any great outdoor music ideas? Or do you have a different version of something we have? I'd love for you to link up to my outdoor music inspiration linky! It is open indefinitely, and is listed below as well as on my outdoor classroom inspiration page! If you would like, grab the code and add it to your page too! I love having a great collection of outdoor ideas to share not only on the blog, but also when I present at conferences and trainings! This is so amazing. I can't tell you how much I love this! I love these ideas! Can't wait to try some of them! When I make our little outdoor music area I'll head back and link it up. Thanks for sharing this with us. Hope to see you again next week. Thanks! We keep adding a few small things. I love all of the ways in which people are making spaces and tweaking ideas. I'm hoping for a bit of dry weather to do some painting soon! Oh, and if you ever want to grab the code to add to any posts for any of my link ups, please feel free to do so! The more people who see and become inspired by others to do something different the better! 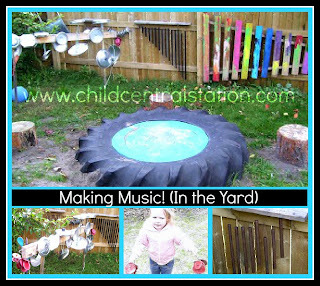 Amy, I love the outdoor music idea and you've done such a wonderful job of creating this! Very creative! Thanks for linking up at Outdoor Play, hope to see you again next Friday!